I had a blast hanging out with my sister yesterday at the spa! We took advantage of an awesome locals discount at the M Resort. Vegas locals: you can get all day access to the fitness center, pool, and spa facilities with the purchase of a manicure (<$27). Can't beat that! I was starving after the spa!! 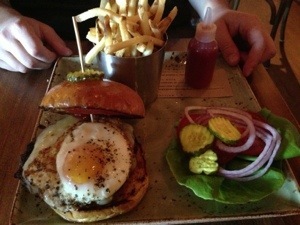 Hard day, I know ;) My husband, sister, and I decided to check out Honey Salt for dinner. 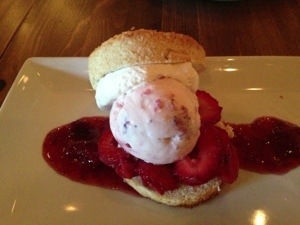 It's a cute little farm to table bistro in Summerlin. 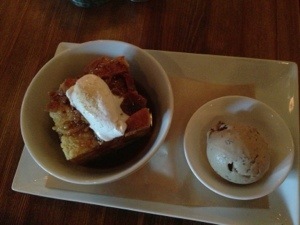 My sister and I had been there for their out-of-this-world bread pudding and brown bag apple pie a few months ago, but this time we were excited to try the dinner fare. 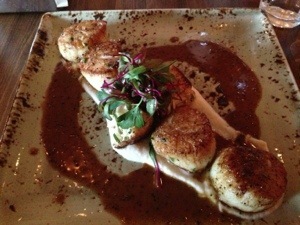 I was really excited to see seared sea scallops with truffle oil sauce, charred cauliflower, and cauliflower purée on the menu! I didn't have to sub out anything. Great dish! My sister had the special- a braised, bone-in pork chop with polenta and sautéed mushrooms. We all loved the food! I’m excited to go back to try the heirloom tomato caprese salad with figs and shaved chocolate. It sounds heavenly! I should probably fill you in on a few thoughts I’ve had about the 21 Day Sugar Detox. Today is day 14. I’ve been doing “ok” on the detox, but I have not been 100% strict. The guidelines are so legalistic. I’m at the point now where the rules are getting on my nerves and I just want to eat good, balanced meals all week and have treats on the weekends! Ultimately, my goal in doing this detox is to get to a cleaner diet overall. I think I’ve achieved that so far. I worry that if I keep on depriving myself of certain foods, it may lead to a massive binge food “retox” after I’m done “detox”ing. Have you ever had that experience? I feel like it happens often to people who severely restrict their food choices. I’ve fallen for that in the past with the Atkins diet and other restrictive eating patterns. Inevitably, I end up putting on lots of weight after coming off a strict eating plan. I’ve seen others have the same experience. Instead, I’ll shoot for eating clean and Paleo-ish for most meals, but then treat myself when I start to miss certain foods. Honestly, that probably won’t happen often since there are so many awesome healthy foods out there! 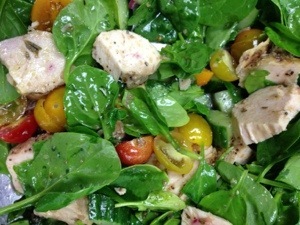 I’ll keep on sharing recipes to convince you it’s true ;) Lots of times the healthier choice is also the tastier choice. Dinner and drinks on a sugar detox makes for a tricky date, but it’s doable. I love Yard House! They have the BEST menu and refreshing pear cider. Although I didn’t get my favorite things, like French fries and brownie sundae, the server was great about customizing my entree. 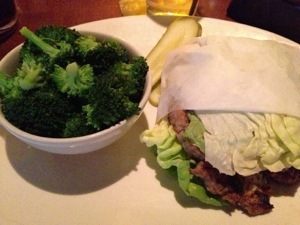 I got a turkey burger in a lettuce wrap with a side of steamed broccoli instead of fries. Pretty tasty, but I scarfed it down way too fast. I was still SO hungry after the burger and Colby was eating his fries and sliders SO slowly… I finally caved and had one of his sliders and a few fries. Whoops! The craziest thing about it is that I immediately felt incredibly bloated after eating that small amount of bread and potatoes. I won’t be slipping up again during the 21 day detox. Let’s just call last night a little midway celebration! 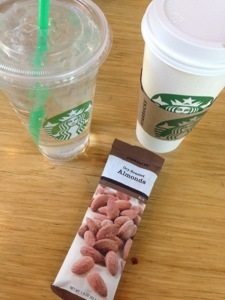 This morning I met with a friend at Starbucks and was happy to be back on track and detoxing. 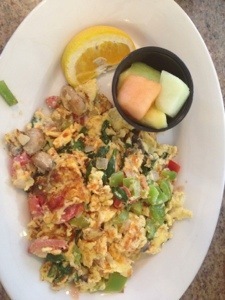 My whole body feels much better when I’m avoiding grains and sugar! The next time I go out to eat, I’ll have to remember how much better it feels to have the right foods! I think the biggest pitfall is fixating on the “forbidden” food rather than focusing on how delicious the healthy option will be. 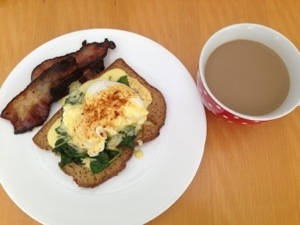 Here’s this morning’s challenge- my sister’s eggs Benedict on FRESHLY BAKED cheese bread…. Uggghhhh! I’ll be having it on paleo bread instead. It will be DELICIOUS either way! 11 days down on the sugar detox! I’m dragging this morning, though. 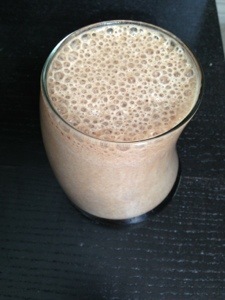 Tired, cranky, no energy… So I decided to make a little pick-me-up drink instead of my usual (gross) unsweetened coffee. Blend until smooth! Makes 2 normal glasses or one massive mocha (what I need this morning). This is much better than my regular coffee! 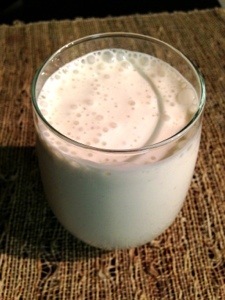 What better way to start a Friday morning than a workout and a creamy, slightly sweet frozen coffee? Enjoy! TGIF! I almost ate a whole spaghetti squash myself tonight! This dish is SO good. The fastest way to cook spaghetti squash is to cut it in half lengthwise and place it cut side down in a shallow dish of water in the microwave. With the turntable off, it should take about 15 mins to cook the squash. You’ll know it’s done when the shell gives a little when poked with a fork. While the squash is in the microwave, place bacon in a single layer on an aluminum lined baking sheet. Cook all the bacon in the package so you have extra for other purposes. Place the bacon in a cold oven, then set to 400 degrees. Your bacon will be done in about 15 mins as well. While the squash is cooking and the bacon is baking, sauté one small chopped onion in 2 tsp olive oil. 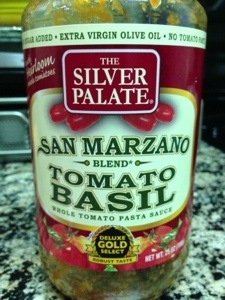 Once golden, add 1 tsp minced garlic and 2 cups of grape tomatoes, halved. Continue to simmer on low until the squash is done. Scrape the squash out of its shell using a fork. Don’t burn yourself! Toss the strands in with the tomatoes, onions, and garlic. Stir in a few tablespoons of your favorite pesto sauce. I like Trader Joe’s basil pesto. Combine well. When the bacon is done, drain on paper towels and cut into bite sized pieces. 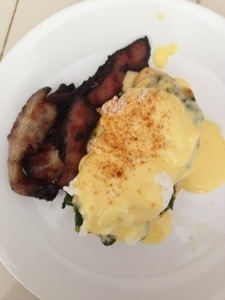 Serve the dish with bacon on top! It’s funny how a little pressure can make you come up with some really creative ideas. 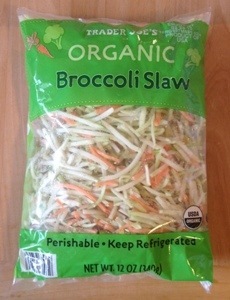 I had to make lunch for work in a hurry today and found the bag of broccoli slaw going bad in my crisper. This “pasta” is like a cross between broccoli cheese soup and Mac & Cheese… So good (for you)! 1. Sauté broccoli slaw in a bit of melted butter. 2. Add a splash of milk and simmer until broccoli softens. 3. 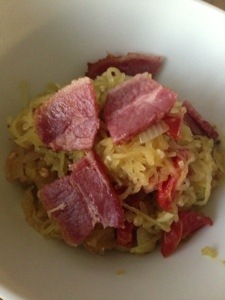 Mix in a big handful of shredded sharp cheddar cheese and stir to melt. 4. Season with paprika, red pepper, and a bit of garlic salt. Serve with leftover chicken or whatever else you can find! Easy! I’ve been craving Italian food all week! Driving home from work, I knew I wanted to use the eggplant in my fridge for some eggplant parm, but wasn’t sure if it could be done on a sugar detox. I was also STARVING so I didn’t want to wait long for it to be ready. 1. Preheat oven to 425. In the meantime, slice eggplant into 3/4″ thick circles. Sprinkle with salt and set aside. 2. Prepare the egg wash by beating one egg in a bowl. Prepare the “breading” by combining ground flax and almond meal in a separate bowl. 5. 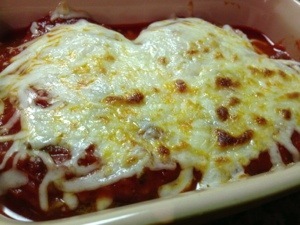 Fill a large casserole dish with 1/2 the jar of sauce, place the eggplant slices in, top with mozzarella, more sauce, remaining eggplant slices, more sauce, and more cheese. 6. Bake for a few mins more until cheese is melted and sauce is heated through. Broil for a few mins longer for a golden, bubbly cheese topping. Blend on high setting until very creamy. Dessert cravings last night got my creative juices flowing! This pudding is so tasty, you’d think it shouldn’t be allowed on a sugar detox (or maybe those are my deprived taste buds talking). 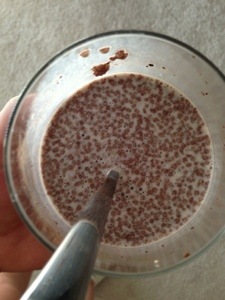 In any case, I think this is a great treat to enjoy on the sugar detox when you’ve already had your fruit for the day. If you’re not avoiding sweeteners, go ahead and add in some stevia or honey. Toss in some berries, too! Combine ingredients and stir vigorously to combine. Refrigerate for 15 mins up to overnight to obtain desired consistency. This pudding is fun to eat, kinda like tapioca. Chia seeds have a fabulous nutrition profile and fill your stomach with fiber, so you can indulge knowing you’re actually having a nutrition dense snack! I don’t always like salads, but with this dressing I could see myself eating them everyday. Serve over mixed greens, tomato, cucumber, avocado, and red onion with feta. Thanks, Kelly, for making this for us in Utah this weekend! It’s the tastiest sugar detox friendly dressing I’ve had so far!